A powerful NASA probe has created the most detailed view yet of the far side of the moon. NASA's Lunar Reconnaissance Orbiter (LRO) took the picture, which was released along with a flood of other data from the spacecraft last week. The photo is actually a mosaic of thousands of different lunar farside images taken by the lunar orbiter's Wide Angle Camera. 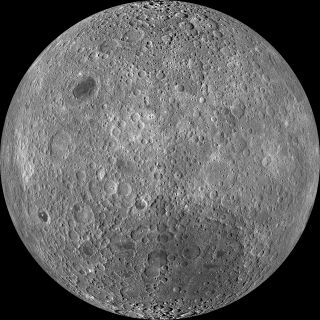 Since then, scientists have learned that the far side of the moon is a very different place than the near side. Widespread basaltic plains called "maria," deposited by volcanic activity long ago, cover much of the near side. But basaltic volcanism was much more limited on the far side, and as a result the region sports just a few isolated maria, researchers said. The new image was built using data from LRO's Wide Angle Camera, one of the three imaging tools on the spacecraft's main Lunar Reconnaissance Orbiter Camera (LROC). The LROC observations are just one small part of a huge mound of orbiter data released on March 14. When taken altogether, LRO's seven science instruments delivered more than 192 terabytes of data in the new release — enough to fill about 41,000 DVDs, NASA officials said. Among the new LROC data products is a global lunar map with a resolution of 100 meters per pixel. Also released werehigher resolution maps of selected parts of the moon, which were stitched together from observations taken by LROC's two Narrow Angle Cameras, researchers said. And there are more moon maps and mosaics yet to come. "The LROC map products being released over the next week will not only serve the lunar science community for years to come, but also provide a roadmap for human exploration of our nearest neighbor," LROC principal investigator Mark Robinson, of Arizona State University, said in a statement. NASA launched the $504 million LRO spacecraft in June 2009 along with a piggyback probe called LCROSS. LCROSS crashed into a shadowed crater at the moon's south pole in October 2009 in a hunt for water ice, which it found. LRO is about the size of a Mini Cooper car, and it's equipped with seven instruments to observe the moon. The spacecraft circles the moon in a polar orbit, at an altitude of about 31 miles (50 kilometers). For the first year of its operational life, LRO spent most of its time scouting the moon to help NASA plan for future lunar exploration missions. In September 2010, the probe wrapped this mission up and shifted into more of a pure science mode to help scientists better understand Earth's nearest neighbor. Even before the latest data release, LRO had delivered in a big way, helping researchers generate the most detailed map of the lunar surface ever made.